Come and sit with me in the Temple of my Violet Flame. Come and let us extinguish what is not of love, what is not of wholeness, what is not of you. SB: Ha, ha, that’s right, a new profession. 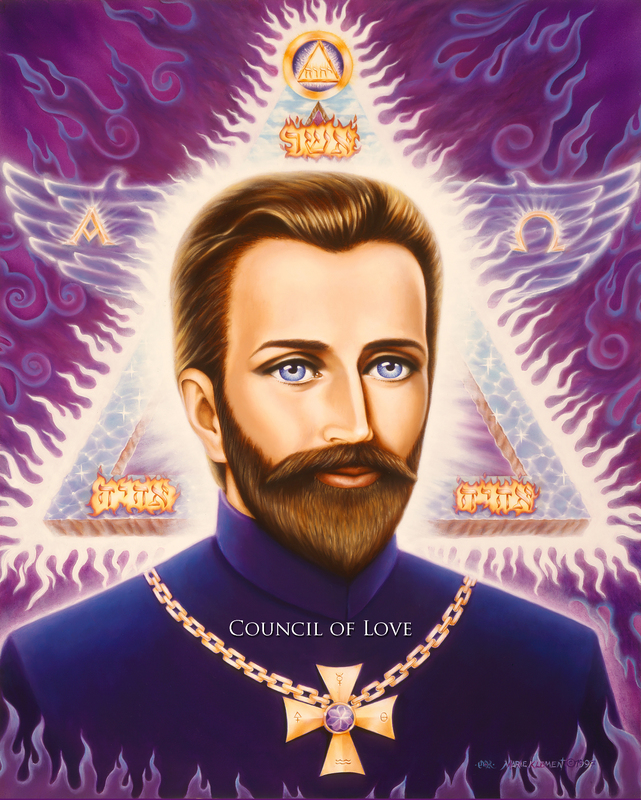 A channel for the Council of Love, author of The New You, Great Awakening, The Jesus Book. And we are d-day minus two on your webinar, Linda, Conscious Creating with the Mother. How are you feeling and what’s your report? LD: The level of intensity has been incredible. Now, and by the way, hi everybody, and I know that the level of intensity also in terms of what’s going on, on the planet, and might I also say, particularly in the United States, although I’m sure, you know, if you live in Syria, what’s going on in the United States is not front and center, but in terms of the Conscious Creating with the Mother, I was just saying to Suzi as we were getting started, that I am a little tired, because you know it was another, it was actually 2:22 this morning when the Mother woke me up and started talking about, “Okay here’s how we’ve been preparing you A, B, C, D.” It was the entire alphabet. And she went through it in detail, and I’m thinking like this is fascinating, but Mom, can I sleep? No. It has been, and, of course you know, but as you have said, Steve, as soon as someone registers for the class, not only the Council starts working with them but I start working with you. So, that’s been interesting as well, getting to know, you know, some old friends, some new friends. This is going to be a great circle, but that’s been really intense too. And then, of course, there’s just the day-to-day, but I decided this morning, Mother Mary said, “You cut off registration Friday at noon.” And we have our webinar, our first webinar, on Saturday at one o’clock, so I’m thinking “Who is it that’s sneaking through the door on Friday morning?” So it has been a miraculous creation for me, and this has been one of my projects because, you know, the Mother always walks me through beforehand. So it’s going to be interesting and it’s going to be fun, and it’s going to be very intense, but in a good way; not in a clearing way, not in a channeling way, not in a processing way, but in an action way. SB: Just to add to all the intensity that’s going on right now, it’s an intense time. LD: And you know, because it’s an intense time, never before have we needed a group of powerful creators, of lightworker, loveholder creators to step forward and start building Nova Earth. SB: OK, I’ll say a little bit about St. Germaine for any new listeners. Ah, St. Germaine, actually, we think of him as having ascended during his lifetime as Francis Bacon, but he actually ascended, I’m told, in Atlantean times. And the process he went through is actually described online in a book called The Holy Trinosophia. And I’ll put these titles in the promo. His long-incarnated life from Louis XV’s reign through to the 1830’s, I was looking around and I think it was 45, is described in The Count of Saint Germaine by Isabel Cooper-Oakley, which is also available online. It’s one of the most enjoyable books I’ve read. His exploits are known to everyone. He would walk through walls, he would leave his guests a large diamond on their name cards, he would seamlessly repair a very large and broken diamond for Louis the Sun King, and I could go on and on and on talking about the things that he is known for having done, but I think we’d probably rather hear from him. Please welcome the Count of St. Germaine. St. Germaine: And welcome to you my beloved friends, my allies, my students, my teachers, my healers, for I am St. Germaine. Let me repeat that. I am St. Germaine, keeper and master of the I AM Presence, keeper and master of the Violet Flame. And in many ways I speak to you this day, of course, from infinity, and the Mother’s infinite ocean of time, but I also speak to you from the healing chamber, and from the Temple of the Violet Flame in Atlantis. Very little ceases to exist and it may pass from what you think of as your present reality or pass into the veils of time, but very little really ceases to exist. And you see that, my beloved friends, in and of yourself, and particularly as more and more you assume your true interdimensional, multidimensional being. And there is past life experiences, memories, preferences, dislikes, because all of this is an integral part of yourself. But what you are also doing, and might I say doing extraordinarily well, is you are also anchoring, welcoming in, embracing what you would conceive of as your sacred future self. So you are embracing your totality. Now, it is important, and I say this to you as one who has lived many lifetimes, and many long lifetimes, that it is important not to get lost in the exploration of the future. But the practicality of anchoring that energy into being, into your expanded infinite being in the here and now, is especially beneficial at this time of transition. So when you look at things, when odd thoughts or impressions or memories float into your mind, your heart, your essence, do not dismiss them by saying “I don’t remember that, I don’t think that’s the way it was.” Simply take the infinite moment to look at what is being brought to your doorway and allow yourself to absorb it. Now I say that with proviso, and here we start to get down to some of the nitty gritty of our conversation today. The proviso is if there are things, elements, memories, energies, it matters not, that are coming to you from the future, from your current reality, or might we say even from past, and it does not even necessarily mean your past, if these energies are knocking on your essence door, which is very large at the moment, and from here on in for that matter, it does not mean if these energies or this essence, is disgruntled, disorganized, discordant, recalcitrant, and I’m talking whether it looks like you, looks like the collective, or a certain event or situation, you may observe it, not in judgement, but in the depth of your wisdom, the depth of your divine authority. Look at it and do not integrate it. Your job, your sacred mission and purpose at this time, I cannot emphasize this enough, is not to take on all the woes, the recalcitrants, the chaos, the mayhem, the hatred, the control of the planet. In fact, it is quite the opposite, and that is why I say, “Come and sit with me in the Temple of my Violet Flame, of the Violet Flame. Come and let us extinguish what is not of love, what is not of wholeness, what is not of you.” Now, there are many energies in existence, and you have certainly been observing them, for it’s hard to avoid, but there are many energies that would dearly love, can we say, to gain entry or to hook onto, and especially you with a clear, opened, beautiful, loving space. The reason is that all energy, not only all beings, but think of it in this way, all energy is, all energy is in movement and in this movement all energy seeks its true essence, and that is love, that is wholeness, that is the divine. So as you are holding this energy of purity, of clarity and grace that the Mother has gifted you time and again, the energy that is discordant or disassociated perceives you and in some ways seeks you. Now it seeks you for two reasons: One, because you are holding the very essence, the true reason it is seeking you is that you are holding the very essence of the divine love, and your love, and that is what it truly wants to connect with, but then there is also the egoic. And yes, situations and circumstance can be very egoic as well because they are being run by humans. This energy also wants to hook into you, to bring you down to a level that is malleable and accessible and will continue to play the game of the old third that will continue to engage in the chaos. And this is not permissible, it is not part and parcel of who you are, it is not part of our Mother’s plan. And let us be very clear, you have worked far too hard to do this. And I do not simply mean the channels, the teachers, the healers, and you have been diligent in your work, I mean those of you who are holding the space, who are paving the way, who are the pathfinders and the wayshowers, the harmonizers: do not let this energy influence you or attach to you. You observe it, you identify it and all of you have been doing this magnificent job of staying within your bubble, as it were, and sending the love, sending the clarity, sending the upliftment. There are times, and this can be particularly true of those who either are in need of healing or who are healers, where you become slightly overwhelmed in your desire either to be healed or to assist one who you believe is sincerely seeking healing. And it is not ever that you say no or nay, but you do not engage in the drama or the mayhem of that individual or situation. Again, you send the energy, it flows from you, but it is a one way flow. It is important that you maintain, more than ever, your sacred space. And in this way, you begin to create Nova Earth, rather than engaging with those that would like to reinvent, because it requires reinvention. The old third is gone. And you say, “But I witness it all around me.” And these are the energies that want literally to reinvent the old. Now we experienced this in Atlantis. And by the way, that is also why Serapis Bey wanted to come and talk. He knew that this was Atlantis week, but let us go on. In Atlantis, we had the islands of temples. The Mother’s Temple of Wisdom, which was next to mine, ours, the Temple of the Violet Flame, and these were sacred places. In our temple, it was where what we referred to as priests, and that was male and female, and it was a secular term, not connoted or attached to any religious belief system. But this was sacred space, and the islands of temples were sacrosanct and pure. But as you well know, there was a push and pull of those who wished to not only find their own gods, but to be God. Now I say this and I want to explain it. Each of you, all of us are God. We are infinite and we are divine, and so are you, beloveds. But it is the connection, the DNA, the literal connection and the energies that the Mother/Father have infused you with, of the blue diamond and the gold diamond and your beautiful pink diamond. These energies are part and parcel of you, so of course it is inconceivable that you are not divine. But that is not what this group, of what we would call in your terminology today, recalcitrants, meant. It was a fall from grace. It was a fall and a denial of love. It was a tearing away, a severing of terrible proportions from the love and from each other, so it was not that they were recognizing their divinity within, it was a denial of Source, an egoic move, a declaration of “Let’s get rid of the hierarchy,” which it never was, and “I am God.” And this truly relates to much of what you have been seeing in terms of declaration of force, which is diminishing on your planet, by the way. We can talk about that as well, but the assumption of superiority, of arrogance, of use and control of authority, it has taken a very long time, tens and tens of thousands of years, for divine authority to be reawakened within you. Yes, at that time with the sinking of Atlantis, there was an implosion/explosion malign activation of the, what you would think of as the generator crystal. Some have asked us why we did not prevent that and why Atlantis sank because, particularly with our star family, arrangements could have been made for disarming and correction, and for remaining a viable land mass. It was important that Atlantis disappear. That it sink into the Mother’s infinite oceans of time and be cleansed and renewed and refreshed, and that those ideations, behaviors, belief systems be eliminated. Now when you utilize, and many of you will be utilizing Sanat Kumara’s Universal laws, you think now, “Why couldn’t we just use the elimination and make it really quick?” That was not the nature of this situation. Now, think of this, the Atlantean City of Light, which is related to me and the Temple of the Violet Flame, and the Temple of the Mother’s Wisdom arises again, coming to the surface of what you think of as water. Because it is time for these energies and these places of bliss and healing be reinstituted. But it has been a long time, and with that, the vague memories of those who wish to control, may approach you. Most of it has been healed. Most of what you are experiencing right now in terms of what you feel as bombardment or exhaustion is, in fact, from the populace that is on planet right now, the human populace. The animals, the elementals, the trees, the grass, the leaves, the stones, the sky, they are clean. They are advanced. But what you are feeling is the battle cry of a defeated segment. Now in that chaos, there are situations that are coming to the forefront so that the collective in their transition to new choices can say no more. We are so sick of this we do not choose to continue in that way. So you, beloved ones, and when I say you, I mean all seven billion of you, are reaching a point, pre-Atlantis, where you will say we are not going to allow this discordant, recalcitrant, hateful energy to destroy us and the Mother’s Plan, and the fulfillment of that Plan that we are one thousand percent, one million percent committed to. So what you are doing is you are already starting not only to eliminate, or organically change with the laws of change or transmutation, you are beginning, but you are doing it not in simply zapping and saying, you’re gone. You are creating the new and that is truly the purpose of the Violet Flame. It is restoration, yes, it has the ability to incinerate, transmute, transform, transubstantiate that which is not of love and wholeness. But what it really does, that is about ten percent. What it really does is allow the new, allow the love, the true I AM Presence to emerge. And that is what I am doing with each and every one of you. I am so excited. Yes, I am somewhat taken aback by the shenanigans that are taking place on the planet, but I am also so excited to be with you, my beloveds. Now where do you wish to start, dear Steve? SB: Right, Okay Your competition, right now, is what’s going on in the world right outside our door. There’s so much investigation happening, shutting down of corruption, crookedness, people leaving, CEO’s, politicians resigning, and you’re saying to us to stay grounded, to stay calm. Is that correct? SG: Being grounded is more important than ever. Now, many of you, and this has been a survival mechanism, particularly in past times, many of you when you witness this chaos and true abuse your mechanism for continuing on has been to almost absent yourself from your body. So for years we would observe you and, note that I have a particular affinity for the crown chakra, as you well know, and I would see you hovering high above your bodies, and really your silver thread, and I call it a thread was very questionable. Now is a time where we have need, where the Mother has need, where you have need for the fulfillment of your plan, and the plan, to truly be physically anchored in your form. So I am not saying that you do not hover sometimes when you are shocked or truly dismayed, but you’re also, your fields have grown significantly. You have heard Ashira and Galea talk about your star brothers having boots on the ground, and that is a terminology that is very familiar to you in terms of military reference on your planet. But what we have need of is your boots on the ground during this time of transition. So that is why I have begun by suggesting you are looking, you are observing, you are seeing the insanity that is dancing outside your front door, that we need you, and you need you fully present and aware. There has been this pattern in the past of, “If I don’t look at it, if I don’t pay attention to it, maybe it doesn’t exist.” And, of course, this is exactly the behavior and attitude or stance that has allowed much of this nastiness to truly gain ground because those who do not participate in such darkness absented themselves. So you are the energy. Whether you are saying it out loud, saying it in your bedroom, saying it to your friends, saying it to your daughter, saying it to yourself, shouting it at us, you are the ones that are saying this is not permissible. Not in judgment, simply in this deep cognizant acceptance, understanding, that none of this is of love. Now, I also want to say many who appear to be of the chaos, and that is a massive generalization, have done so as an offering of their mission and purpose, their soul contract, to bring this recalcitrance, reluctance, disinterest, and disinterest continues to be a massive segment of the population, to bring this to a head. So even those, that is why there is no room for judgment. As revelation, and there is going to be more, as revelations are coming to the surface, make sure that you only stay in the love, boots on the ground but do not judge those that you think or believe, first of all that are acting out of self-interest or abuse, but also those that are sacrificing themselves. There is a greater plan. Now it is hard to say this to people who are experiencing deep grief and sorrow over the loss of their children, their friends, or their comrades, but nevertheless, this is part of the plan. SB: It’s also hard to follow that when one is faced with the kind of ridicule that goes around these days in political discussion. Its level is really very low. No, no, it’s what has to be gone. SG: The level that is so low is done so that the collective is saying this is not a conversation that we wish to have. This is not a conversation worth having. We are not going to sink and live, as happened in Atlantis, at the lowest common denominator when you are saying that you are God and we must follow or be shot. SB: There are four phases of the divine plan going ahead simultaneously right now, it seems. One is accountability, the other is ascension itself. And the third is abundance and the fourth is disclosure. Can you talk to us a bit about how these all relate and impact on each other? I’ll give you an example, is abundance waiting upon the ending of accountability? SG: Now, let me… I understand that you have segmented these in order to be able to work with them, in order to be able to comprehend them, but these are not, in fact, separate areas of undertaking or evolution. All of this is part of ascension. Part of this is all related to your stepping forward as your ascended self, not merely claiming, but living. Now let us go through this. As your ascended being, an ascended being, by its very definition, and by its very nature and character, by its spiritual, physical, mental, emotional makeup is accountable. It cannot be any other way. When you are living, and you are the law, then, of course, you are not only accountable, but in many ways which perhaps you do not fully understand and this is not a reference that you are making, but you are already are abundant. So that is not a fragmentation that you want to hold as a hard and fast rule. Now, responsibility, accountability, of course, are first cousins, and we put this under the umbrella of stewardship that we have spoken to you of, and certainly Archangel Mikael has spoken to you of. And how can you be a steward in the true meaning, the definition that it implies as an ascended being in service to the Mother, in the full deputization to the Mother/Father/One if you are not responsible and accountable? Now there are many who are saying, “Oh I’m accountable, I have a plan, I am doing my work” that aren’t accountable. And that is both within the lightworker community, the loveholder community, and of course, the rest of the world. So there is an emphasis on accountability because you, as you are flying in and out of this ascension portal, as we and you have come to think of it. You do not get to anchor in a higher realm if you have not wrestled with and adopted this level of what we would refer to as higher accountability. And you cannot have full disclosure or what you are referring to as full abundance unless there is a leadership, a stewardship, significant enough to deal with what lies ahead. You already know, and we are glad to be talking about it further, because it is a time of bluntness and I am one that has always been known for being blunt. Money is not the solution to your world’s problems. So, there are some very intense and positive, very positive, growth and definition that is taking place. And yes, at times this means that some of your core issues are coming to the forefront, not for lengthy processing, although for some it still is. But I am talking to those who are ready to go forward in the fullness of their stewardship. It is about taking into account in very practical ways the truth of what you are here for. So, to answer your question, disclosure and abundance come after and interrelated, because this is all interwoven into accountability, responsibility, stewardship, and all that is part, sweet angels, of your ascension. Is that clear? SB: Oh, it is clear, but I guess I’m a little worried that what that means is that we’ve got months and months and months to go before abundance hits, and we might as well all hunker down and get through it any way we can. SB: Not to do that. SG: To take the Violet Flame and work with me on creation. SG: Go to the future. Go to where that paradigm has shifted, and pull it back into today. SB: Okay. You do realize that I think so many of us are just bone tired. SG: Are you too tired to take a purple crayon and write on your pad “abundance, disclosure, accountability, ascension?” I do not think so. SB: You bet. Well said. Well, we’ve only just got about a few minutes left. What do we need to do next? What is next for lightworkers? I know the whole program has been about that, although it’s really been about positioning ourselves to the events that are coming our way. What about us? What about what we can be doing, not necessarily in a spiritual way, but in an external socially related, socially relevant way. What can we be doing? SG: This is a very good segue from your last question, and I want to finish that question as well. When you say you are tired, when you are saying, really what you are saying is that you are somewhat distraught and worn out. And I am teasing you and in a kind of paternalistic way saying, “Take the purple pencil and write what you are calling on.” But if you feel too tired to do that, simply come and sit with me in the Temple of the Violet Flame. And this goes for preparing yourselves, restoring yourselves, fueling yourselves. If you feel too tired to simply write on your pad, come and let me refill you with the I AM Presence. Then there will be no containing you. So as a daily practice, it doesn’t matter if you transform or transmute your recliner chair into the violet bonfire, I will be there. Your bed into the violet bonfire, I will be there. Spend some time in the flame and this will really help. SB: Thank you for that. SG: I want you… in terms of what can you be doing, many of you have significant, doable, enjoyable, beautiful plans on how you wish to proceed. In terms of practicality my advice and social responsibility, stewardship, I have two things that I would recommend: One is the first and the foremost is, of course, drift into the future, see what’s there and bring it back. See as if you are gathering, throwing your nets the same way you did with Yeshua, the same way you’ve done so many times, throw your net and bring it in and anchor it in your heart, in your legs, in your cells, in your being. Bring that future dream into your now. Time is fluid. Also, see in your heart’s desires is what do you feel drawn to? As an interim step, what do you want to do to help out? Those, shall we call them in the grey category who are wanting to feed on you and wanting to tear you down. Well, of course you are not going to permit that, but what can you do in terms of sending them energy? And when I say sending energy I do not simply mean the energy work, I mean the smile in the coffee shop. I mean the quiet word. Then, second thing, well really third, have a look around your community. You do not need to travel to Tanzania or even Syria. Enough of you are doing that at night with your beloved Michael. Look around your community and see who needs a helping hand. And it may be offering your services in a variety of ways that are in accordance with your talents and abilities at a help center, a very broad category – help center, rehabilitation center, community action center, but it can also mean helping someone across the street who’s in a wheelchair, or an older person who’s hobbling. And it’s not that you’re saying, “You’re hobbling.” What you’re really doing is saying “I see you. I see the wisdom in your eyes. I see the travel of the years. Let me have a kind word with you.” Because so many of the older people are lonely and they feel forgotten and overlooked and they have such wisdom and insight to share with all of you. So if there was one thing, turn to those that you think of as the elderly and help them. Help them share their wisdom before they go. Give them permission to go. There are so many leaving the planet at this time. That is a soul decision and it is honored deeply. SB: Wow. Thank you very much for that. Now we have reached the end of our show, I’m afraid. SG: Well, I, thank you for allowing me to come and to visit in this week of Atlantis. SB: Ha ha. Thank you. Is there anything you wish to say in closing, St. Germaine? SG: I am helping, you know, the Divine Mother and Raj with the Conscious Creation, so look for me there as well. But I am never further than your fingertips, beloved. I love you. SB: Thank you St. Germaine. I love you.